This CD also features some fantastic drumming by Jim Riley – the drummer for Rascal Flatts. Jim played with Jeff for several years before he started touring the world with the Flatts, and was in fine form laying down drums on several songs. "A dash of Hendrix, a scoop of funk, lots of jam, and a big dose of rock and roll. This should satisfy anyone looking for amazing guitar, soulful vocals and great tunes." 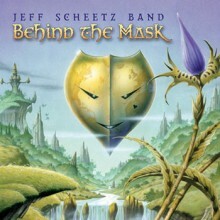 To solidify the attitude of “back when the music was real” the band tapped into Jeff’s longtime friend, world famous fantasy artist Rodney Matthew s to produce the original artwork for the cover. Rodney has been doing album covers for bands such as Nazareth, Thin Lizzy, Magnum, Asia, and tons more since the late 70s, and his work on “Behind the Mask” is as captivating as any. Behind the Mask has been nominated for "Rock album of the Year" at the JPF music awards!! The Just Plain Folks music awards is the largest music awards in the world - this year they had 42,000 CDs submitted!!! They went through many, many rounds of listening and narrowing down, to get to the final 10 nominees. That means out of thousands and thousands of rock CDs - Behind the Mask was one of the 10 that stood out! “Behind the Mask” goes way beyond just a guitar album. Oh don’t worry, there is enough tasty guitar riffs and searing solos to satisfy the most discriminating six string aficionado, but the amazing soulful vocals and twisting grooving bass playing of Matt Waddill along with the sometimes frenetic but always in the pocket drumming of Kent Burnham make this a complete music lovers “top pick”.